Pain, hot and sharp, pierced through Nadine’s ragged awareness. She gasped, forcing her breath inward and choking on the cry threatening to escape. She couldn’t yell out. Not here. Not now. That would alert them…alert him, to where she was. She would not let that happen. Not again. She reached out to halt her fall as her knees buckled. Rough and jagged tree bark bit into her flesh, pulling, tearing, and digging into her skin. Her teeth clamped hard on her chapped lips and she tasted blood, tangy and salty, a torment to her parched mouth. Nadine shook her head. She couldn’t let herself dwell there or finish the thought. She had to meet up with River, first and foremost. Then, she could decide what their fate would be. From his carrier against her breast, a young toddler stirred, pulling her from the self-incriminations. There would be time later for those. Provided she survived the night. Even in the darkness, the head of golden blond hair still managed to shine as he wormed and wiggled about. A small face tilted upward and his light brown eyes gazed at her. He blinked several times and opened his mouth. Nadine’s heart skipped. If he cried now, they would be found. But he merely yawned, rested his head against her, and closed his eyes. A wave of relief rushed through her body, leaving her feeling weak. She braced herself against the tree trunk. The sedative she had given him before this mad flight still held him in its grip. She forced herself on, intending to push deeper into the woods towards safety. But as soon as she put pressure on her foot, the pain flared again, bright and fresh. Nadine lifted her now bare foot. Her shoe lost somewhere among the rocks earlier. 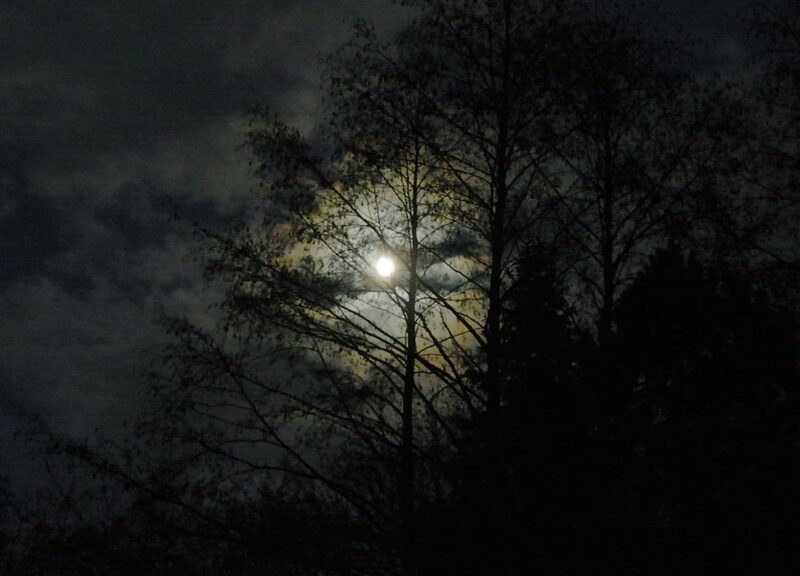 She didn’t need the light of the full moon to see the brambled stick that came up, clinging to her foot. Lying to herself with the thought that it would be like ripping off a stubborn band-aid, Nadine yanked the offending piece of forest debris off. Pain seared the sole of her foot, a hungry fire. She set the foot down and tried to put weight on it. Again, her body protested. She felt the remaining thorns dig themselves further into the soft flesh. She’d never make it like this. Clamping down her panic, Nadine searched for anything to ease and protect her foot. Nothing. Not even a fallen branch long enough to serve as a walking stick. She had no extra wraps and would not take clothing from Colby. The night air was bitter in this early autumn, and she’d not expose him to such conditions. She had her shirt, but nothing to cut a strip with. She’d have to use the whole thing then. With care to not disturb Colby in his carrier, she slipped out of her thin shirt. A shiver ran down her now exposed spine as a breeze mocked her venerability. Nadine wrapped her injured foot as best she could. Then, in spite of the pain, she forced her body to take the weight and stepped forward. “One step. One more step…You can do this. You have to do this,” Nadine whispered. If she told herself that enough times, maybe she could trick her body into believing it. Time ceased to have meaning as her world narrowed down to the small patch of ground just in front of her. One painful step after the next, one lie after the next, Nadine pushed her mind and body further and further on. One moment, it was dark. The next, man-made light flooded the area about her from behind. Refusing to admit defeat, Nadine straightened her shoulders and turned around, arms encircling Colby as if they would shield and protect him from the imminent harm about to consume them. Nadine tightened her muscles to keep from shaking. She would not give him the satisfaction of seeing her fear. Instead, she readjusted her arms around Colby. Jacob shook his head. She knew she must look a fright, her long brown, hair tangled and wild, falling into her brown eyes. Her arms covered in scrapes, pants ripped, shirtless, and one foot crudely bound with said shirt. He tsked. She refused to respond to such an obvious lie. Which would have been a mercy, she realized. He, instead, would toy with her like a cat with a mouse. “I don’t understand it, Nadine. Well, okay, I do. No doubt he reminds you of your own lost son, yes? A young boy in peril. A child guilty of nothing more than a simple miscoding in his DNA, now at the mercy of bloodthirsty killers…Tell me, Nadine, do I look bloodthirsty to you?” With each word, he moved closer. The shadows as if living things, wrapped themselves about his body, clinging to the darkness pulsing through his veins. “Even Satan appears as an angel of light.” She took a step back, fighting a whimper of pain. “The truth is you’ll kill him.” She pressed Colby closer. From in his carrier, Colby shifted, protesting her embrace with a low moan. Nadine shook her head. There was no honor or clean death awaiting Colby back in the city. There was nothing more than a poison-filled needle to be thrust into the back of his skull with no one to hold or comfort him while he screamed in pain. Then, insult to injury, his body would be tossed in the flames, lost among all the others deemed unfit, unworthy of water rations. His light would be lost to the world and in exchange, they’d put his name on a wall? As if that made up for his murder? Nadine turned to flee, cursing herself once more. How many times would she play the fool to this man? She let him keep her talking, let her body rest and grow stiff, let the enforcers tighten their net about her, making her and Colby’s chances of escape all the harder. Fool! Her injured foot would not incline itself to bear her and little Colby’s weight under such conditions anymore. She fell, rolling on her side and taking the impact to spare the child. White, searing pain, lanced from her shoulder up through the back of her skull. For a brief moment, all she saw was white. As the world returned, she felt hands pulling at the carrier, intent on wrestling the babe from her. She tried to roll to her other side, bringing her arms up, and using her fingers and nails as claws. Awakened by the sudden jarring, a thin wail of fear rose into the air. “Get away from him!” Nadine screamed, thrashing and writhing against her assailant. One swift kick to her lower back was all it took. Her body arched in pain, exposing the pack with Colby. Before she could recover, the booted foot came down on her neck, pinning her to the ground and cutting off her air. Desperately, she tried to claw at the offending limb but found it protected by thick clothing. The pack was lifted from her body, taking the child with it. Jacob shifted his weight, releasing some of the force from her neck. Nadine’s shrieks mixed with Colby’s cries, rending the night air in discordant song. The sharp crack of a bullet ended half of the chorus. Nadine stared as Jacob dropped Colby’s now silenced body to the ground. It fell with a sickening thud. “He could have passed on with all the honors of Remembrance. But you had to drag him out here to die like an animal instead…Now he will never be remembered.” Jacob stepped away from her and reached into his pocket. Nadine closed her eyes. She would die now, too. A fitting end for her failures. She didn’t deserve to live. Instead, she heard the soft crack of a pod being opened. She watched as Jacob drank the clean water from a water tree pod. His Adam’s apple bobbed up and down as he swallowed. He lowered the pod, saw her watching him, and then, with deliberate slowness, poured the remaining water on Colby’s body. Jacob moved and knelt beside her. His hand reached for her. “Just kill me,” Nadine said, refusing to look at him. Unbidden, her eyes turned towards him. What game was he playing at now? “That would be far too merciful. You’ll get the experience of dehydrating to death. Just as that child would have suffered if you’d gotten your way. And to make sure of it…” He pulled out his gun and shot her in the lower leg, near her knee. Nadine screamed in pain and clutched the wound. Her eyes closed as defeat consumed her. “Copy and acknowledged,” an unknown male voice answered him. Jacob sighed, followed shortly thereafter by the sound of him walking away. The night passed slowly, seconds merging into minutes, and minutes blurring into hours. Through it all, Nadine drifted in and out of awareness. Here in the woods would be a good place to die. Here, she and poor Colby would return to the earth from which they were formed, as had all their ancestors before them. This was a clean death. “Nadine!” a panicked male voice cut through the darkness. River. That was River calling her name. “Sweet Jesus, Nadine.” Hands, rough and calloused, grabbed at her shoulders and sought a pulse at her neck. Slowly, she forced her eyes open and squinted against the dawning light. She wanted to push him away, wanted to refuse the water. What had she done to deserve it? But instinct took over and she swallowed, greedy for the life-giving liquid. The water woke her further, bringing waves of fresh pain to her wounds. Her groan turned into a whimper. She waited for the tirade and the recriminations to come. River had protested her getting close to Jacob from the beginning. He had seen clearly what she had blinded herself to. If only she had listened to him. Tears flowed. But who she cried for, Colby, Jacob, or herself, she could not begin to say. Nadine drew in several shuddered breaths, forcing her tears down. River was right. She had to live and push forward. It was high past time she started listening to his sage counsel. Never again would she disregard his words. River shook his head. “No. That won’t happen, Nadine. Not as long as we have a beating heart to remember him by.” He left her side and picked up the carrier, strapping it to his body. A small hand slipped out, fingers curled in an empty grasp. Tears stung her eyes, but she brushed them aside. Someway, somehow, Jacob would pay for this. He would own to what he did here today and the life he chose to end. Never again would she allow another child to be lost in such a fashion. She would not lay down and die. Not when there were more children like Colby. They needed someone like her. And with God as her witness, one way or another, somehow, she’d find a way to save them all.